I teach students in my Grocery Budget Bootcamp class to always have an old yogurt container in the freezer for chicken stock. I usually get a couple strange comments and looks, so I explain that the container is for kitchen scraps – anything and everything that could possibly be added to chicken stock to enhance the flavor should be put into the container. In this last class, the odd looks didn’t disappear and I could tell more questions were coming. 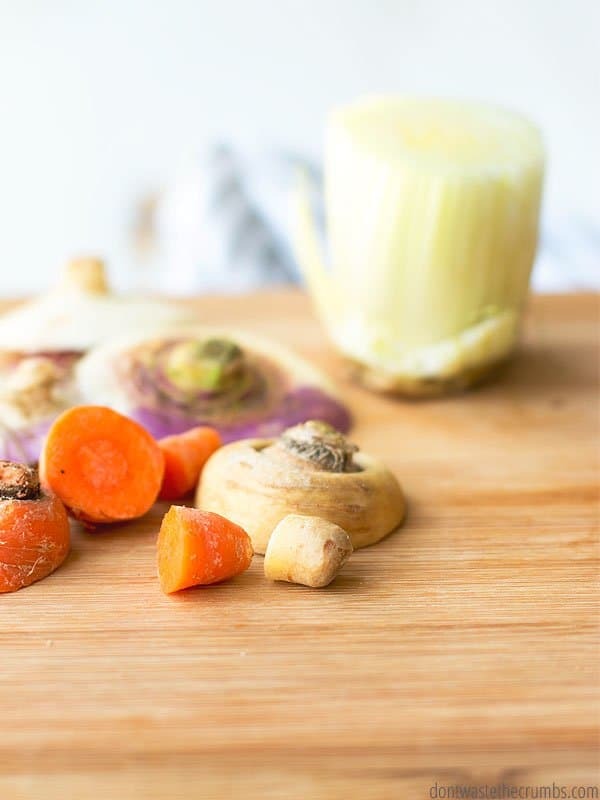 This is one of my best and longest used money saving tricks, so I thought I’d share with you guys just exactly how to make chicken stock using kitchen scraps, including which scraps you should avoid! Yes, there are kitchen scraps you should NOT put in your homemade chicken stock, so you shouldn’t really put “anything and everything.” I use that phrase though, because there is SO MANY KITCHEN SCRAPS you could put into homemade chicken stock, that you’ll never look at kitchen scraps the same way ever again. 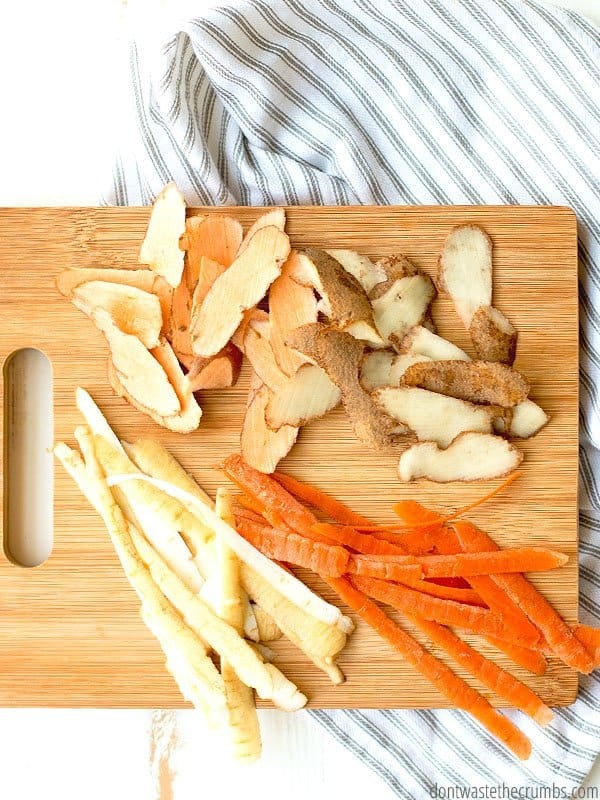 Instead of peeling carrots and potatoes over the trash can, or having a ‘trash bowl’ like Rachel Ray, or even hauling your cutting board to the trash can when you’re cleaning up, you’re going to look at your kitchen scraps as pieces of gold. Because really, these scraps are how you can make the best chicken stock you’ve ever had. And once you taste it, you’ll NEVER go back to store-bought, and you’ll think twice about throwing your kitchen scraps away! The first step though, is to break out of the mindset that kitchen scraps belong in the trash can. This goes for peels, rinds, skins, cores, stem, greens, leaves, cobs… ANYTHING you would typically throw away can *possibly* be used in homemade chicken stock. The second step, is to realize the importance of washing ALL of your produce. I admit that I sometimes skimp on washing cantaloupe or pineapple… typically the foods where we don’t eat the outside. If I’m not eating it, why bother washing it? 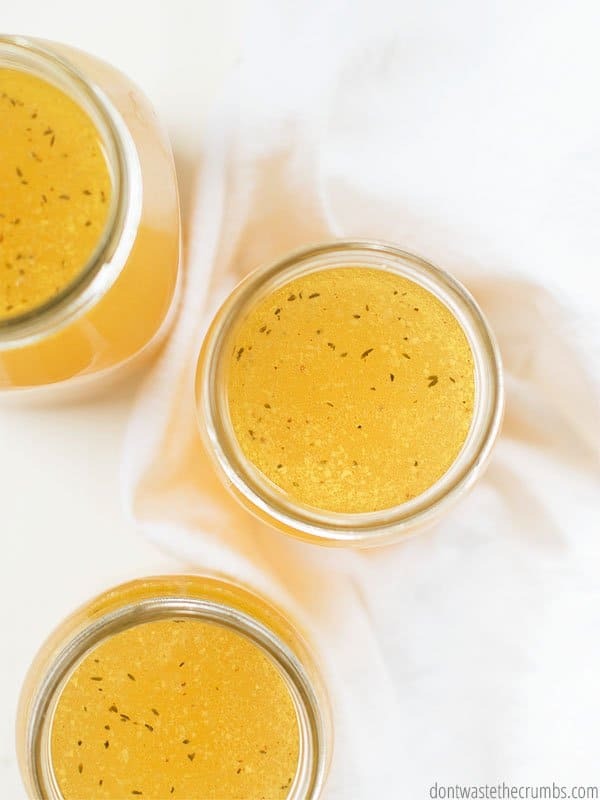 Since you ARE eating these foods now – or at least, are using them to add flavor to your homemade chicken stock – you do need to wash them. As a frugal person, I don’t recommend picking up produce wash at the grocery store. They’re all over-priced and over-rated. It turns out that they [fruit and vegetables washes] aren’t any better than water. Multiple studies have found that produce washes such as Fit and Earth Friendly are no more effective in cleaning produce than regular tap water. In a study of three commercial washes, University of Maine researchers found that distilled water was equally if not more effective in removing microbes such as bacteria and mold. Since produce washes are costly, they advise consumers to simply wash fresh fruits and vegetables with water instead of wasting their money on unnecessary washes. I suggest using one of these natural fruit and vegetable wash recipes instead (I use #8) and buying as close to the source as possible. Speaking of buying as close to the source as possible, buying organic doesn’t get you out of washing your produce. ALL commercially grown organic food is sprayed with pesticides. Yes, the pesticide must be on an approved list by the United States Department of Agriculture (USDA), but pesticides are pesticides and the quantity of pesticide used isn’t always controlled. Buy the best quality you can afford, always wash your produce and save your kitchen scraps for chicken stock to make every dollar count! It doesn’t really matter where the bones come from, but the quality does matter. Similar to the idea of the quality of your kitchen scraps, since you are using these bones for homemade chicken stock, you want to buy the best quality you can afford. Personally, we’re committed to buying organic chicken. We think it tastes better, but also because we save every single bone for stock. There was a time though, when we couldn’t afford for all of our chicken to be organic. In those cases, I bought organic whole chickens, but bought conventional pieces (i.e. breasts, wings, thighs, drumsticks) and saved just the bones from the whole chickens, and discarded the bones from the conventional chicken. You can decide what’s best for your family, but as I mentioned, you need chicken bones! In addition to chicken bones, you also need kitchen scraps. Herbs – most mild ad savory herbs are great for stock, like chives, parsley, and basil. See “Herbs” below for which ones to avoid. Avoid scraps that you don’t like. 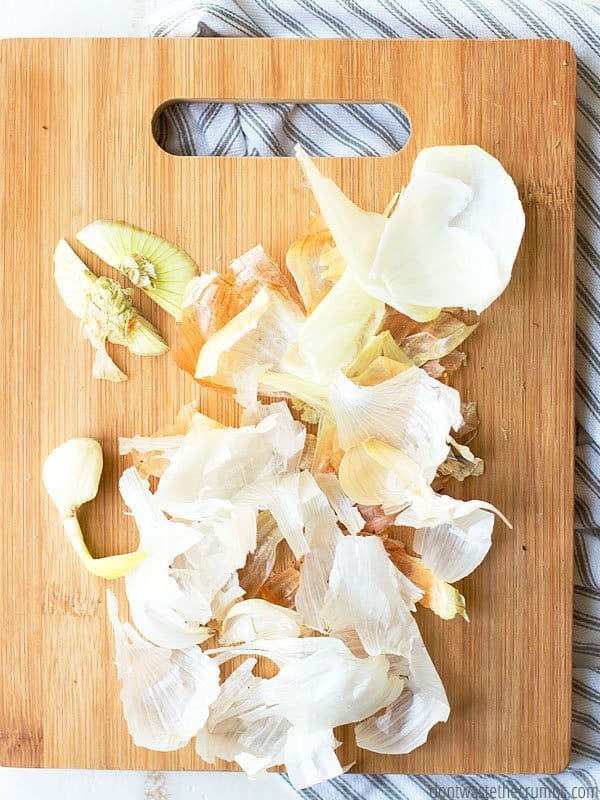 Your kitchen scraps will impart flavor to your stock, even though you’re using just a little bit. If you don’t like asparagus, then certainly don’t add the ends to your scrap container! Some scraps will make the chicken stock cloudy, which may or may not be a big deal. Naturally occurring starch in potatoes, corn and other vegetables will come out as the stock cooks. This isn’t a big deal to me personally, but I just wanted to make sure you knew. The best homemade chicken stock will come from a variety of kitchen scraps. If you only put a container full of eggplant scraps alongside your chicken bones, your chicken stock might not taste that great! Be sure to use a variety of kitchen scraps so the flavor is evenly balanced and rich. Items you avoid for homemade chicken stock may be great in soup! There’s nothing wrong with adding Brussels sprouts and cabbage and herbs to a pot of homemade minestrone soup. But we don’t want the flavor of these foods to be imparted into a big batch of chicken stock. The flavors are just too strong! Especially when you consider how you may use that stock… cabbage-flavored homemade macaroni and cheese, anyone? Your kitchen scraps can be raw or cooked! Anytime I make Instant Pot Chicken, I keep those herbs an vegetables for my next batch of stock. Don’t forget about your spice cabinet! Although we’re talking about kitchen scraps in this post, a tablespoon of black peppercorns and/or a teaspoon of celery seed can go a long way in homemade chicken stock. 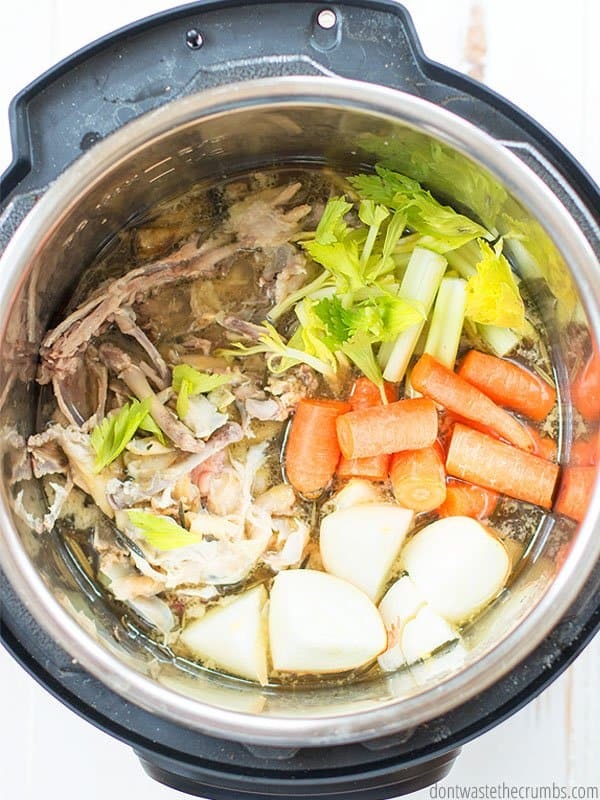 Once you have chicken bones and kitchen scraps, you can start making chicken stock! Here’s my method for making slow cooker chicken stock, and here’s how to make Instant Pot chicken stock. If you want to make chicken stock on the stove, combine everything in a big pot and simmer for 2-4 hours. I have an 8 quart Instant Pot and use about one gallon of chicken bones to one gallon of kitchen scraps. The more bones and scraps you have, the richer and more flavorful the broth will be. Don’t forget that you can re-use the bones and scraps for multiple batches of stock! Here’s my exact method for making chicken stock. Make Instant Pot whole chicken. Leave the liquid in the Instant Pot and remove the chicken. Pick the meat off the bones and put all the bones back into the Instant Pot. Add my frozen chicken bones and frozen kitchen scraps. Add 1 Tbsp black peppercorns and 1 tsp celery seed and fill the Instant Pot to the fill line with water. Press the “broth/stock” option and cook on high pressure for 25 minutes. Strain the stock through a colander, set over a 12 quart stock pot. Put the bones and scraps back into the Instant Pot and repeat steps 4-6 until the stock pot is full. Let the stock cool to room temperature and ladle into old yogurt containers. Freeze for homemade stock whenever I need it! Start with chicken bones. After you make a whole chicken for dinner (use your Instant pot or slow cooker), save the bones for your next batch of stock. Or save the bones from chicken pieces. Cook your kitchen scrap chicken stock in your Instant Pot or slow cooker (I have this Instant Pot and this slow cooker). 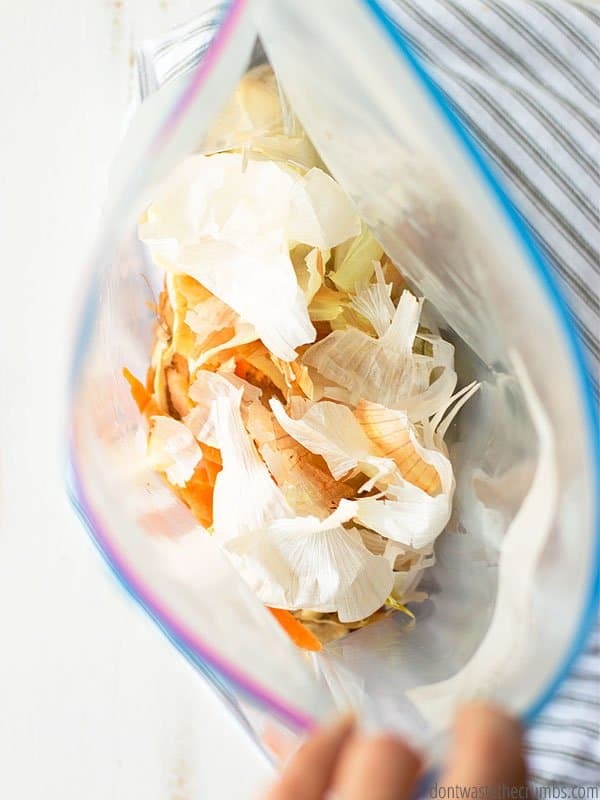 What type of kitchen scraps do you add to your homemade chicken stock? Have you found anything that you SHOULDN’T add? Leave your ideas and tips in the comments below! I’m curious why you have broccoli on the worst veggies list? I save broccoli stems and frequently add a couple to my broth. I usually do the slow cooker method so maybe the pressure cooker is different. Also, I used to cook a whole chicken in the crockpot, but now I rely to make sure I have time to roast my chicken in the oven. The added roasting flavor comes out it the broth and is amazing. You can make Turkey broth after you roast the Turkey at Thanksgiving too! It’s very flavorful! Corn cobs!? I make my own chicken stock but never considered adding corn cobs. Interesting. Corn cobs tend to add a little sweetness, and will contribute to the cloudiness Tiffany mentions,because of their ‘milkiness’. Once someone has eaten something (like chicken off the bone) I could not put that into stock. Other than that it all sounds good. To each their own Christine! You really should wash cantaloupe and other fruits and veggies before cutting as they often carry germs. When you cut into the fruit your knife will transfer whatever is on the outside to the fruit. Anyy thought s about cucumbers or zuccinni? Both seems innocuous but any reasons not to add then? I’m also going to add bits of tomtato – thoughts? I think cucumber in small quantities would be fine, as well as zucchini because it’s so mild. Tomato will add some flavor, but if you don’t mind it in your final product you’ll be fine! Hi there, I am halfway through my first whole30 and found your website so helpful so recipe ideas! 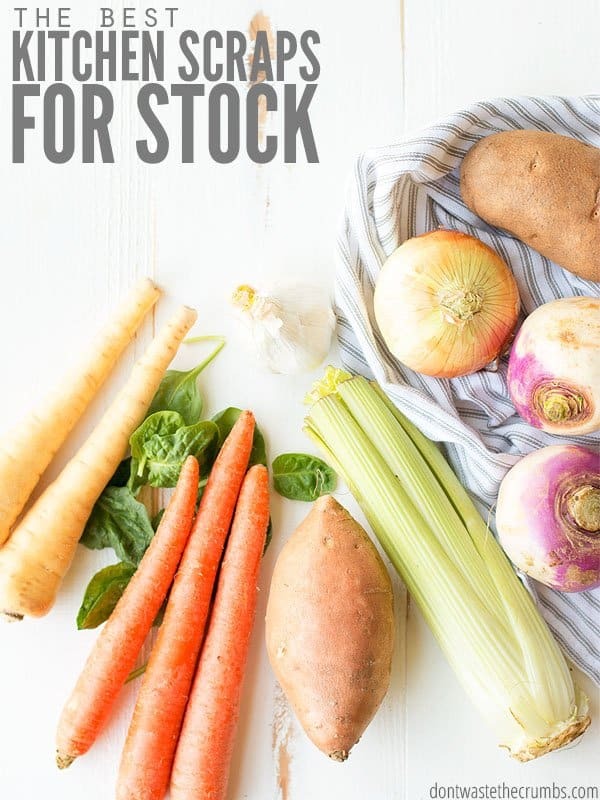 I am having trouble finding a compliant vegetable stock ( I live in Australia) so am planning to make my own. Could I use your method and suggestions above and just not include the chicken/bones etc? Can you use the giblets from inside the bird? I made the chicken and was going to make bone broth with the bones but wasn’t sure if I could add them to it. I believe the giblets in my were the neck and either the liver.